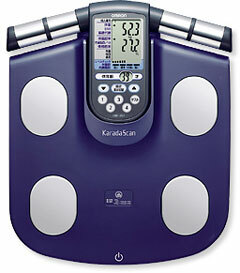 KaradaScan Check HBF-357, Scale/Body Composition Monitor | OhGizmo! Let me start by saying I hate all alphabet soup product names. That, however, is not the point. This is a wonderful scale from Japanese company Omron Healthcare that, aside from telling you how fat you are, also tells you how much of that is skeletal muscle, body fat and visceral fat. On top of that, you get info about basal metabolism, BMI (body mass index), visceral fat rate, and body age. That’s a whole lot of information gathered through the soles of your feet and I’m sure the science behind it is fascinating. It’ll be even more fascinating for someone that cares a little more than me. What matters, to little ignoramus me, is that it’s actually affordable, at about $90 if you don’t count the ticket to Japan and it comes out three days ago, on July 5th. Check out the website here. Story VIA Medgadget.